UNDERSTANDING THE PECKING ORDER « THE BRYCE IS RIGHT! « HAS TECHNOLOGY TRULY IMPROVED OUR LIVES? – Do you know your place? You would be hard pressed to find an institution that does not have a “pecking order” delineating authority through superior and subordinate relationships. The order ultimately dictates the authority we assume and our duties and responsibilities. 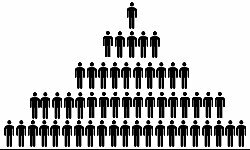 Companies, both large and small, have some form of hierarchy with a leader at the top and the workers underneath. Nonprofit organizations also have such an order, be it a religious institution, fraternal order, homeowners association, sports club, a charity, or whatever. Any formal organization incorporated under the state requires certain positions, such as a president, vice president, etc., thereby suggesting a chain of command. Informal groups will also have a pecking order, including gangs and organized crime. Such orders are a natural part of life and we should all be cognizant of our position. Although job descriptions typically define the pecking order in any corporation, there are other attributes delineating relationships, such as seniority and skill level. Whereas seniority is based on tenure at work, skill sets distinguish people by proficiency, e.g., expert versus novice. In other words, we have learned to respect the wisdom and experience of our elders, that they may know something we do not, along with the talents and abilities of people. However, years of service is not always a good yardstick for measuring competency, which explains why we also consider skill levels. In families, the pecking order starts with the parents and typically works down the line of children by age. Again, if a child shows signs of particular skills or initiative, and an elder child does not, it is possible for the younger child to climb the pecking order. In the absence of parents, who are unavailable to exert leadership, children will supersede the authority of the adult and establish their own rules and make their own decisions, a rather unhealthy situation, yet a reality in today’s world. Man is a social animal and, depending on the situation, is always looking to exert his will over others, usually for his own personal benefit. The idea everyone in a body of people is equal is simply ludicrous, at least for administrative purposes. There always has to be a leader, someone in a position of authority who assumes responsibility to establish and enforce rules of conduct and make ultimate decisions, if for no other reason than to break ties. Without it, there is chaos. As a member of any institution, you would be wise to know your place in the pecking order and, in order to maintain harmony, do not try to break it unless necessity calls on you to do so. NEXT UP: MOVING DAY – It can either be a painful or enjoyable experience. It’s what you make of it. LAST TIME: HAS TECHNOLOGY TRULY IMPROVED OUR LIVES? – Ever wonder about the cost of technology? This entry was posted on November 18, 2013 at 6:00 am	and is filed under Business, Management, Social Issues, Society. Tagged: Florida, palm harbor, The Bryce is Right, tim bryce, UNDERSTANDING THE PECKING ORDER. You can follow any responses to this entry through the RSS 2.0 feed. You can leave a response, or trackback from your own site. “I will say that the person who thinks of others would not seek to exert his or her will on others for their own benefit. It would be for the benefit of all or even for the other person. That’s for sure, that’s for dang sure !